Every good parent knows that the best way to keep a child behaved is by allowing them to let all their energy out in their own time. High energy levels in children cannot be avoided. It’s part of their biology. However, that doesn’t mean it cannot be moderated. One of the best ways to let children ‘get their energy out’ is by allowing them to play to their heart’s desire. Let them run, jump, swim, and even scream. When all their energy is spent, they will slow down, and will either start behaving, or just go to sleep. It’s really that simple. Of course, safety is still a very important thing when letting kids play. Many parents like to buy toys that encourage kids outdoor play. However, playing outdoors also presents many dangers to young children. For example, kids who climb trees run the risk of falling and incurring injuries. Likely, there is also the risk of exposing your children to ‘undesirable strangers.’ Any good parent would want to avoid these types of incidents. Fortunately, there is a way to have your children run wild with minimal risk; and that’s by getting your own play equipment. One of the niftiest play equipment to get is a trampoline. A trampoline is a perfect gift for a child to let out all his or her energy. Moreover, owning a trampoline would make your child look really cool to his or her friends. Of course, not all trampolines are the same. There are trampolines that are designed for adults, for exercise and acrobatics. There are also trampolines that are made with substandard materials and may be unsafe for heavy use. If you want to get your child a good trampoline that’s safe for his or her use, then do your best to make sure that it’s suited for his or her age and size, and that it’s made with high-quality materials. For this article, we will be reviewing My First Indoor/Outdoor Trampoline Combo, a children’s trampoline that’s especially made for both indoor and outdoor use. 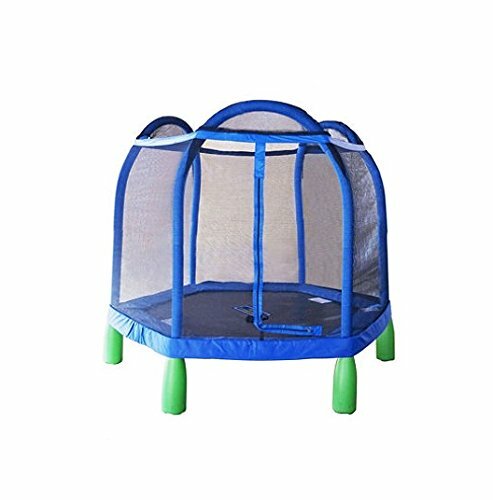 My First Indoor/Outdoor Trampoline Combo is a great trampoline set for children. The set is especially made for children ages three to 10 years of age. It’s a small trampoline that weighs 80 lbs, and unlike most trampoline sets, which are exclusively made for outdoor use, this particular set is great for both the indoors and outdoors. This trampoline set is made for young children, thus the size of it is small, especially compared to normal trampoline sets. As the set is small, it can easily fit into an indoor space; ideally, one’s basement or a spacious playroom. And of course, My First Indoor/Outdoor Trampoline Combo can also be used outdoors, as most trampoline sets. This trampoline set also has great safety features, which makes it great for young children. The trampoline is enclosed in a safety net, which ensures that the children using it won’t fall out and hurt themselves. The enclosure itself is made of sturdy steel poles and PE netting. It also features safety springs, which are covered in durable pad protectors, for safe bouncing action for your kids. My First Indoor/Outdoor Trampoline Combo is made of high-quality materials that don’t easily break, making it perfectly safe for your children. As mentioned above, a key advantage with My First Indoor/Outdoor Trampoline Combo is the safety it brings. As it can be used indoors, you won’t need to worry about exposing your child to the physical and social dangers outside when allowing them to play. Also, you don’t need to worry about the trampoline set not being well-suited for your children. My First Indoor/Outdoor Trampoline Combo is especially made for young kids, and so, appropriate safety features have been put in place to ensure that they don’t get hurt. You won’t have to worry about them falling out of the trampoline, or getting hurt because of the springs. Another great advantage with My First Indoor/Outdoor Trampoline Combo is its flexible usage. You won’t have any problem with using the set indoors, since it can fit in most spaces. Ceiling clearance won’t be a problem either. A clearance of about eight to nine feet would be sufficient. Likely, the trampoline set takes up very little space. You can set it up in your basement, or in a medium-sized bedroom. Of course, not everything about My First Indoor/Outdoor Trampoline Combo is good. One very evident downside to this trampoline set is that it can and will be outgrown by your children. It’s not the type of trampoline set that your children (or even you) can use for a long time. As soon as your kids outgrow it, it’s no longer going to be usable. This is due to the fact that it’s only made for the handling of young children. The trampoline will likely be unable to withstand anything more than that. Another obvious downside is the trampoline sets capacity. Again, it is a very small trampoline set, and thus can only handle a limited number of kids in it, depending on their sizes. Unlike a traditional trampoline, which a number of people can use at the same time, My First Indoor/Outdoor Trampoline Combo has a very limited capacity. If you have a big family, with more than two children, this might not be the best option for you, since not all of your children would be able to enjoy the trampoline at the same time. A SpringFree Trampoline would be a better option which offers the same safety features. One last negative point to note on My First Indoor/Outdoor Trampoline Combo is that it has assembling issues. Although very satisfied, many users have remarked that this trampoline set is not very easy to assemble. Most parents have commented that the set will likely require two adults to put up. Although this is not a huge set back, it is something worth noting, especially for people who may not have access to help when assembling the trampoline set. Overall, though, My First Indoor/Outdoor Trampoline Combo is a great option, if you’re looking for play equipment that’s both safe and handy. Click the link below to see some helpful customer reviews.